The mortality rate of the world in this generation rounds up to an average of a hundred and fifty thousand people every single day. And according to a study, one of the top most reasons why death is faced by many was due to road accidents which were the outcome of reckless movements. These statistical researches cause people to be vigilant with their actions especially when a certain risky incident will lead to a vast domino effect. Along with a risky move is the probable effect of getting involved in an accident. This is the reason why companies, institutions, and organizations conduct a specific process which is known as a risk assessment procedure. This process is to determine and enlist the possible hazards in the premises. It is vital to have this assessment to minimize as well as omit the chance of having to spend a company expenditure for curing and for the hospitalization of an injured employee or company member. 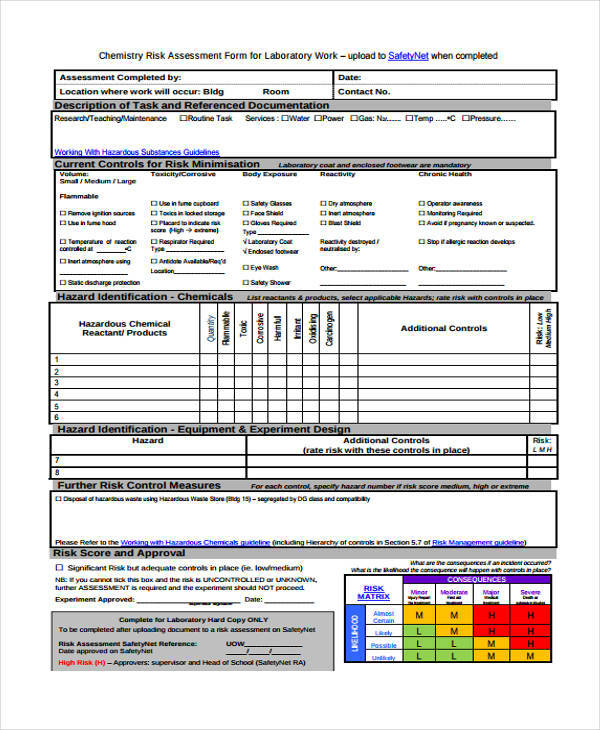 A document which will aid this process is a risk assessment form which will have the list of the areas found in a location and a table for tallying the hazards and dangers. 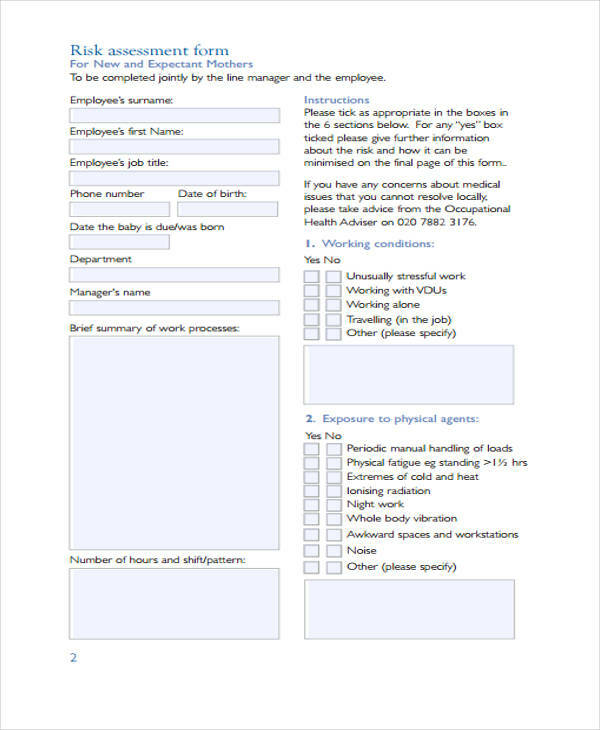 Maternity Risk Assessment Form – This form is used by employers and company management to distinguish if they have any employees who are pregnant and if their work areas are safe for them. 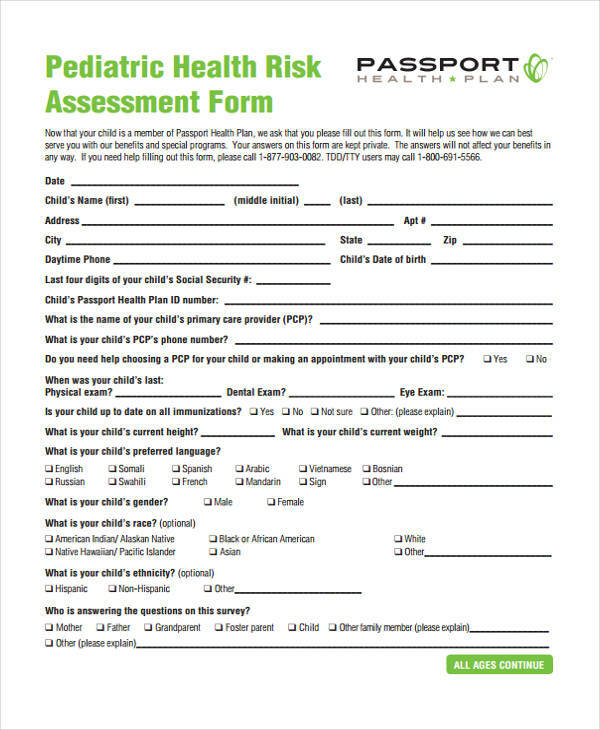 This risk assessment form will also include the risks and hazards which may be experienced by all women in the area who are in their child-bearing age as well as those who are lactating women. The women who fall under the maternity category must present their current medical statements to the company to inform the management and to let the management decide on what to be done in order to cater and provide their needs. 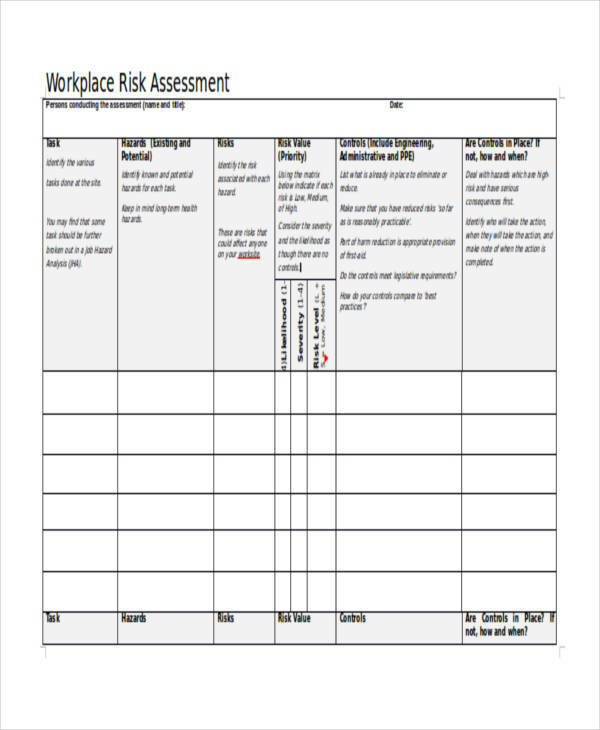 Workplace Risk Assessment Form – The tough life of being an employee and an employer is seen even in the job application duration due to the competition and the stress which is evident in the process. 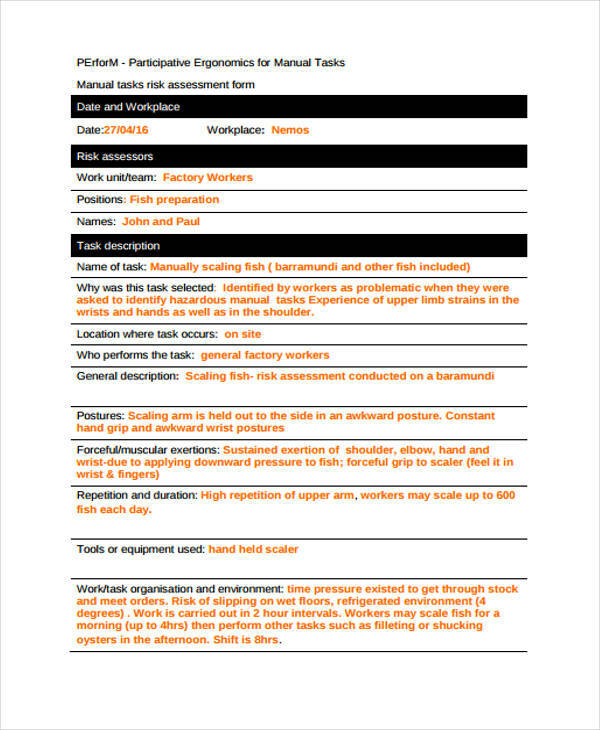 A workplace risk assessment will distinguish what glitches are found in the company with regards to physical and emotional risks. Aside from the emotional stress which may be caused by the increasing workload of an employee, violence is also one of the main reasons why a risk assessment needs to be done in a workplace. With the form, the company will know if there are bullying, threatening, and any form of violence which are silently observed by employees and the company’s clients. 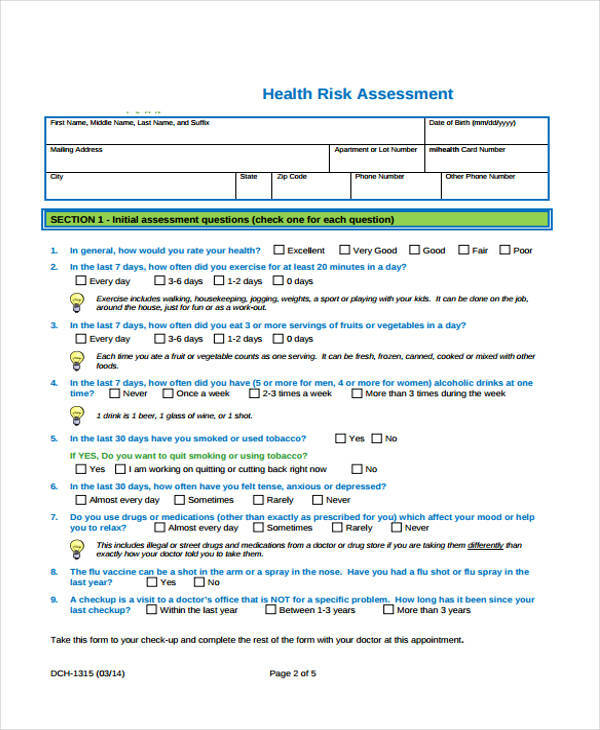 Health Risk Assessment Form – It is a common saying that health should be the most cared for wealth of an individual. This is due to the relation of a healthy being to successfully achieving the daily goals. In fact, if an individual is sickly, he will not only affect himself but also the people around him as well as the company if he will be filing a leave application due to his illness. 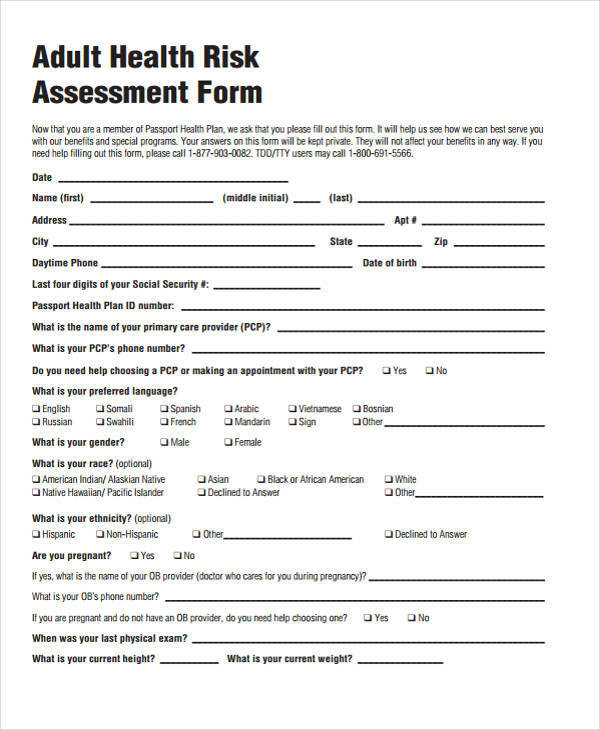 However, with the health risk assessment form, an individual and an organization will be able to know if there is a need for regular medical examinations, vaccines, and clean up in the premises to achieve a healthier environment. 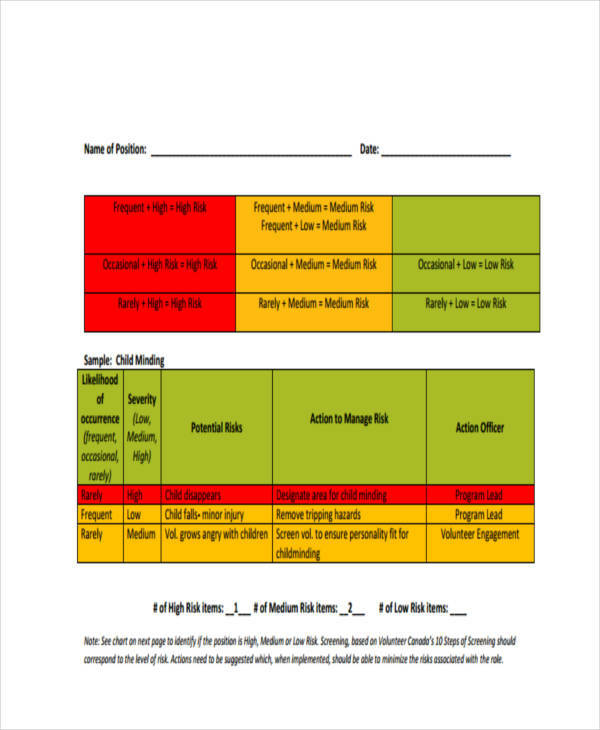 School Risk Assessment Form – Aside from companies, educational institutions are also prone to dealing with dangers and risks not only for their students or for the school’s premises but also for the school’s management or administration. 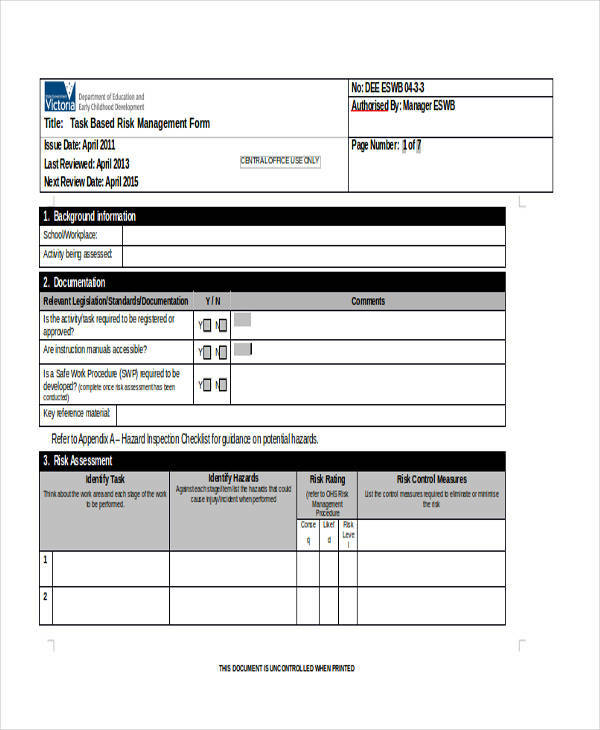 A school risk assessment form should indicate the issues and problems which may be faced by the school administration such as the matters about financing, and the designation of duties and responsibilities. 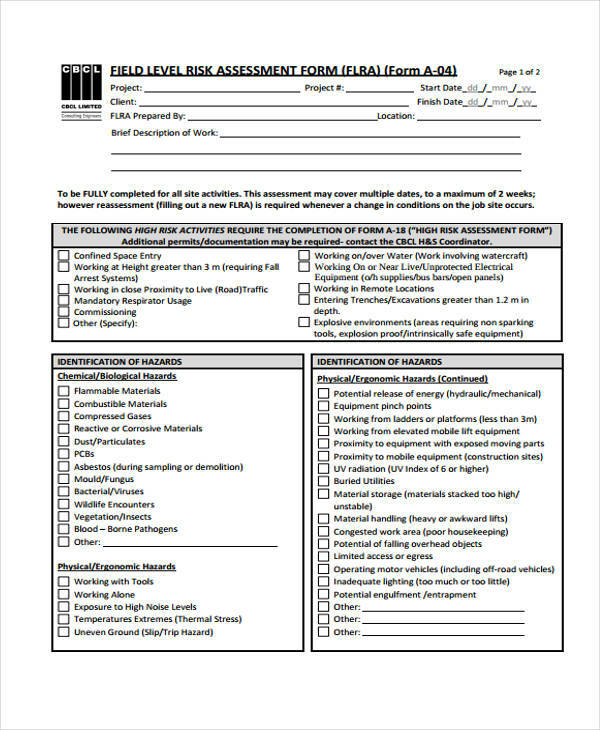 The assessment form will also serve as an in-depth school report which can be done on an annual basis. 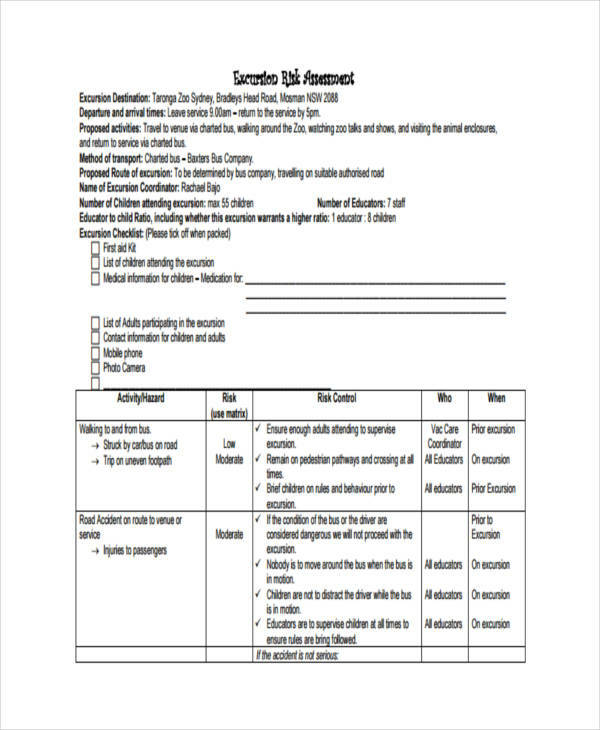 Task Risk Assessment Form – Training, emergency drills, and even arranging supplies can be categorized as varieties of tasks. 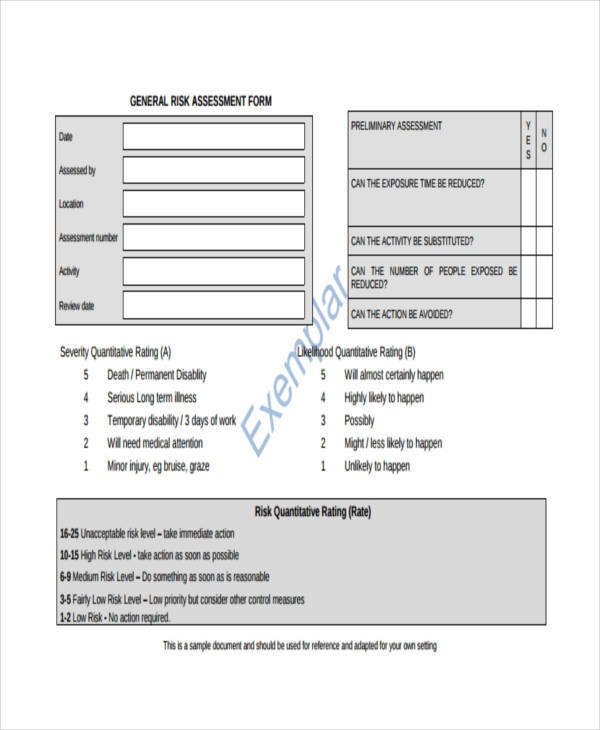 A task risk assessment form will aid in time tracking to know how many days should a task be done and what possible problems which need to be fixed to successfully carry out the whole task. 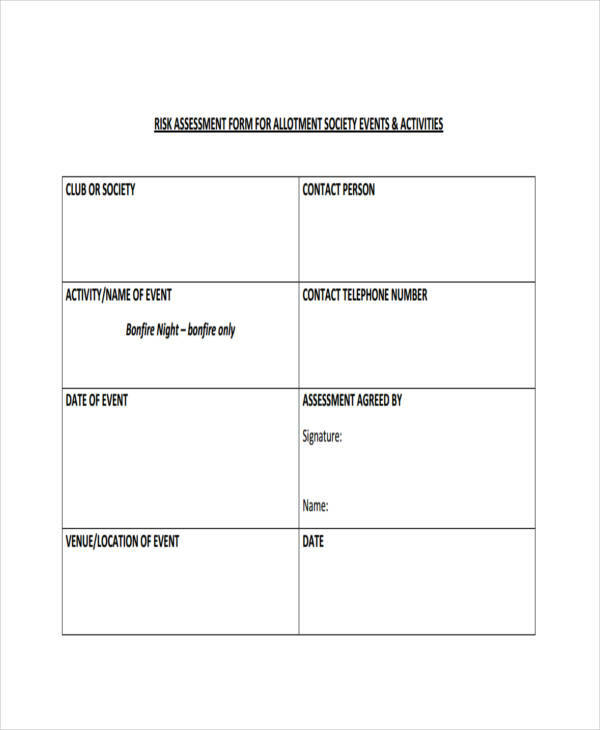 This form will also state the dangers that the assigned people may encounter as they do their duties and what they should do in order to accomplish and omit causing accidents. 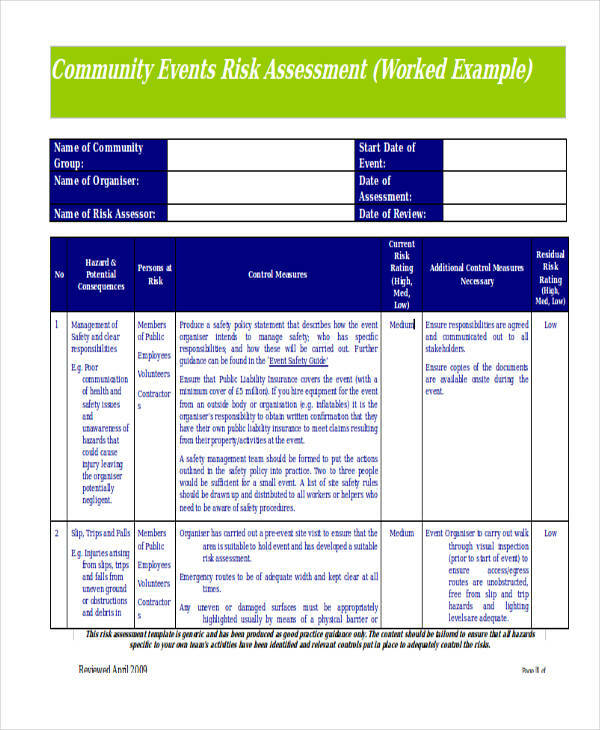 Event Risk Assessment Form – Regardless if an event is within a community or if it is held outdoors, there should be enough time to spare in conducting an event risk assessment. This is to assure that outside nature such as rain, storms, the wind, as well as the heat index of the day will not affect the whole event. 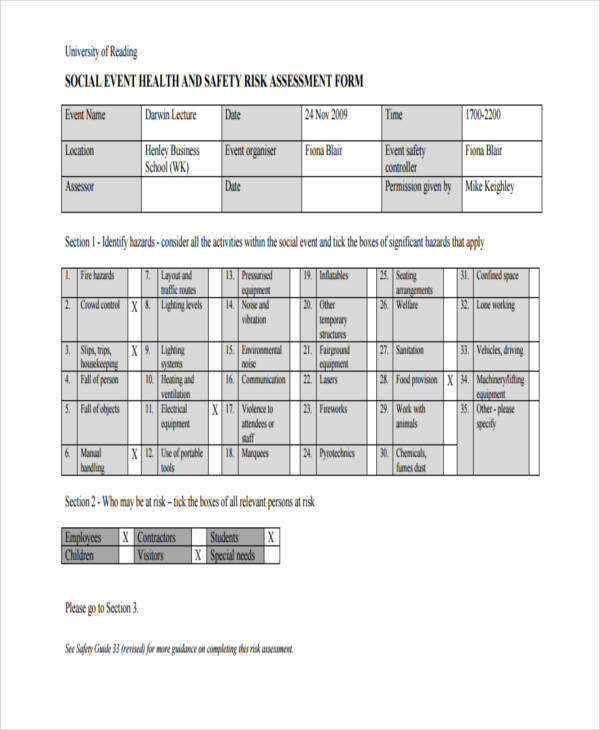 The event risk assessment form will also help in constructing an effective plan with regards to how many tents should be prepared, the amount of event budget needed, and how many members of the staff should be hired as the event crew. An event organizer should not stick to creating a single plan as there may be changes to be made a few days prior to the event. 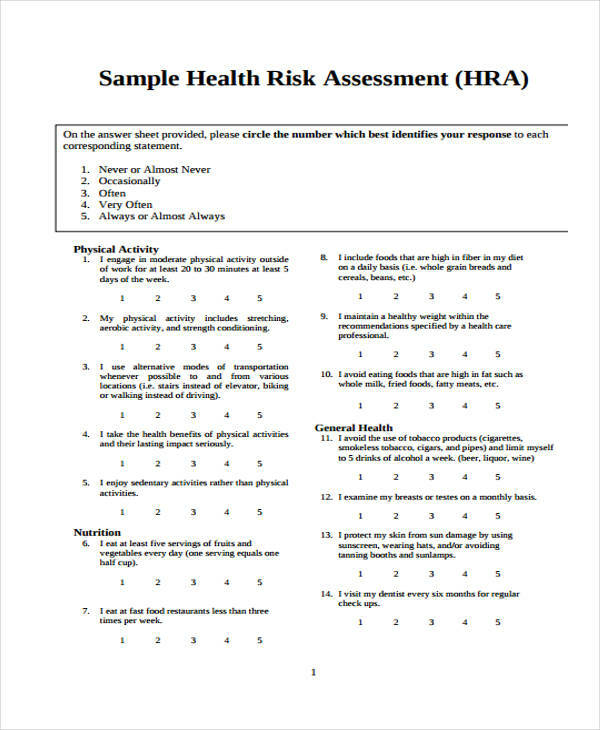 Tree Risk Assessment Form – This form will be used for those organizations who will conduct a tree planting activity. 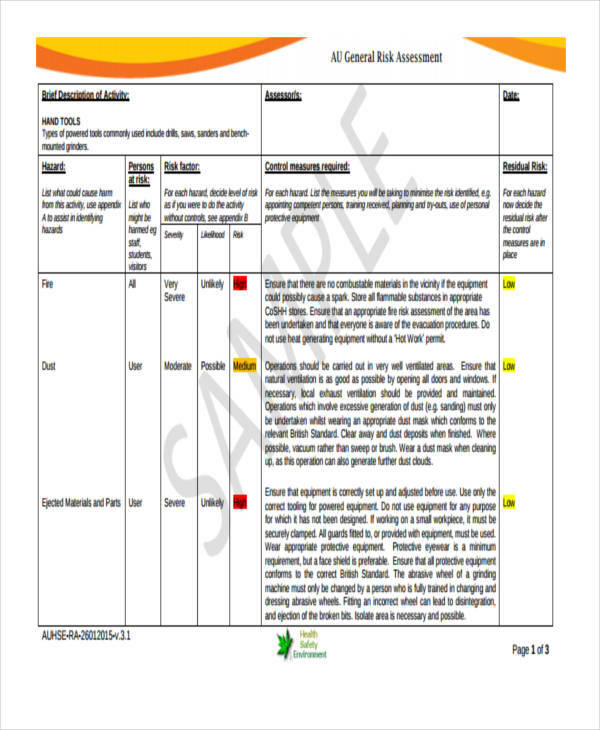 The tree risk assessment form will indicate the specific type of tree species and the physical descriptions of the trees brought for planting. With the form, an organization will know where and how a tree should be planted in order for it to live. The condition of the soil, site changes, wind direction, and the probability of pests will also be stated on the form as part of the risk assessment. The organization should have this assessment before they will conduct the tree planting activity to assure the health of the trees. 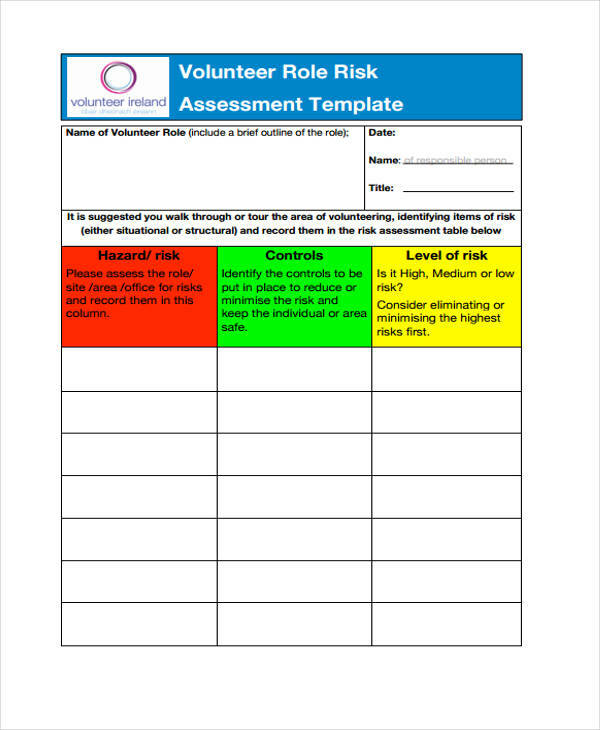 Volunteer Risk Assessment Form – This will be used for volunteering activities and groups. The form will have the general information of the volunteer which includes his role in the group for the specified activity. In the completion of the form, the group will know what areas in their team should be corrected and be changed. 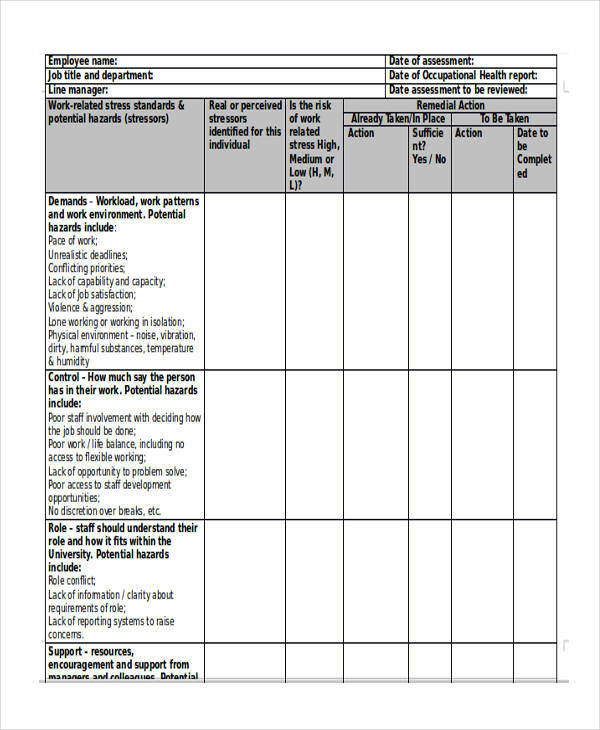 The level of risks that the group may face, the type of risks, and the controls which can be linked to omit and solve the risks will be written in a table form to promote a well-arranged and formal lay out plan for the group. 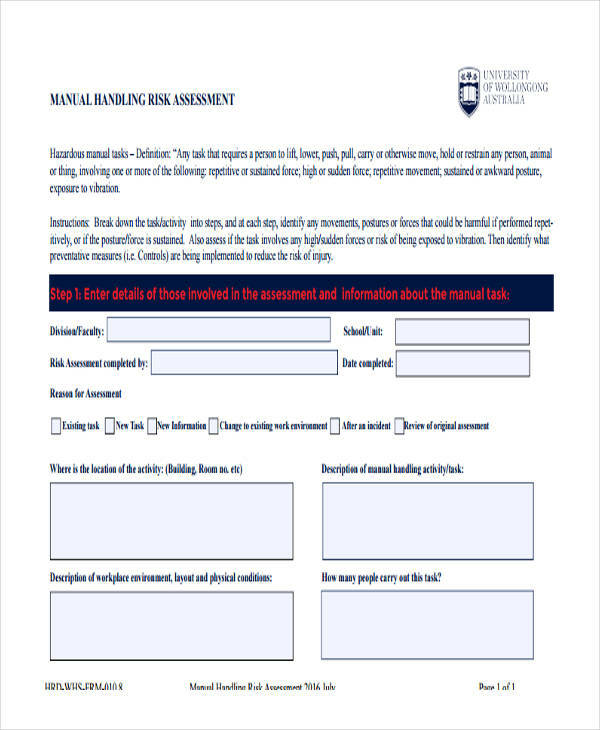 Manual Handling Risk Assessment Form – Moving materials from one place to another will require the use of machines and manpower to lift and place the materials. With this, a manual handling risk assessment will determine whether they may be risks involved if a specific box or cargo will be moved. This is often used when by companies who provide a delivery order as well as cargo companies when a cargo or a stored material contains a fragile property inside. 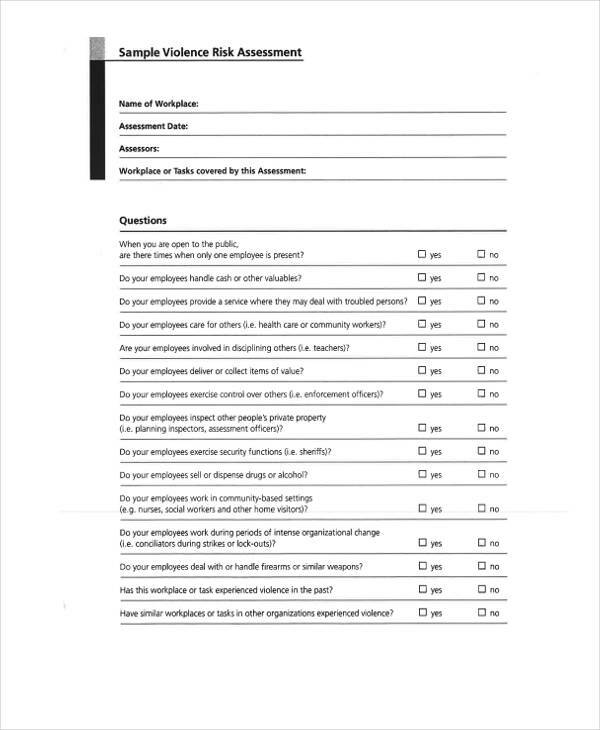 This assessment form will aid the movers or the personnel assigned for the materials to know what is inside, where it should be located, and how it should be handled. 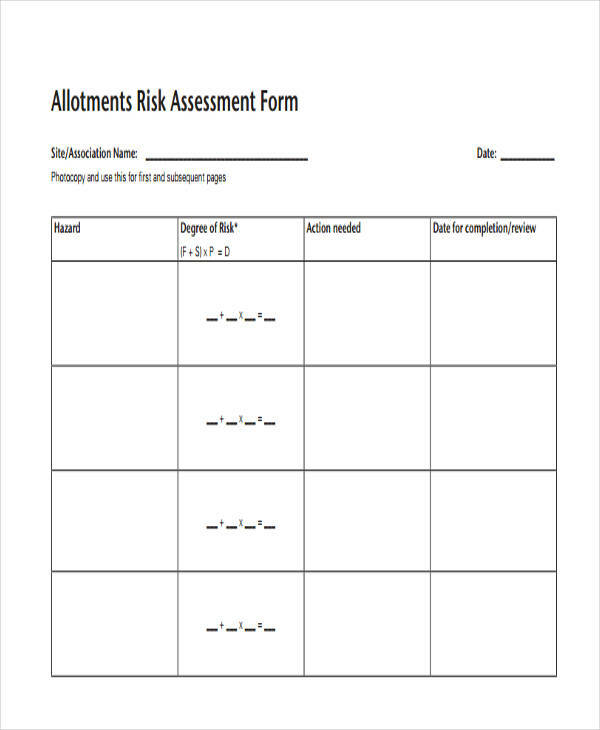 Allotments Risk Assessment Form – The term “allotments” refers to a piece of owned land. With the allotments risk assessment form, the land owner and a renter will be able to state and enlist the condition of the property. It will state the hazards in the property such as a barbed wire or an uneven stone pavement which may cause an injury to the renter and the land owner. 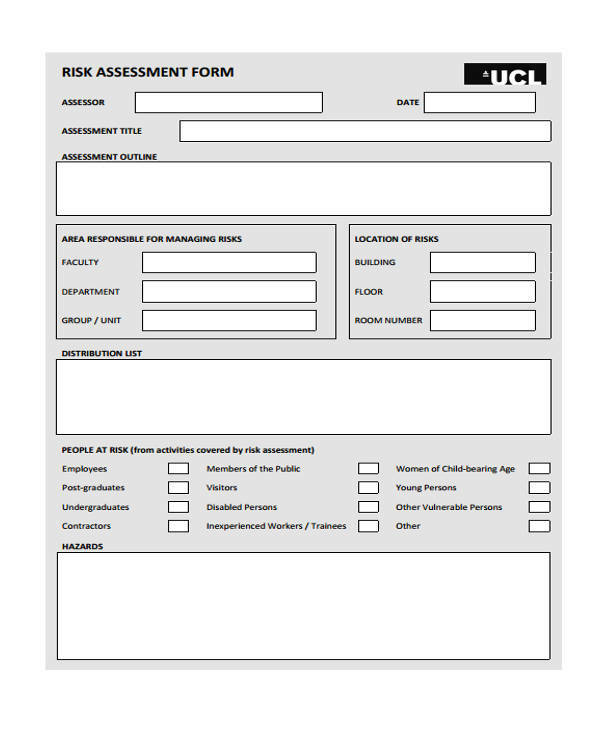 Some allotments risk assessment forms have an area for computing the risk degree which is composed of the frequency, severity, and the injury probability observed in the property. 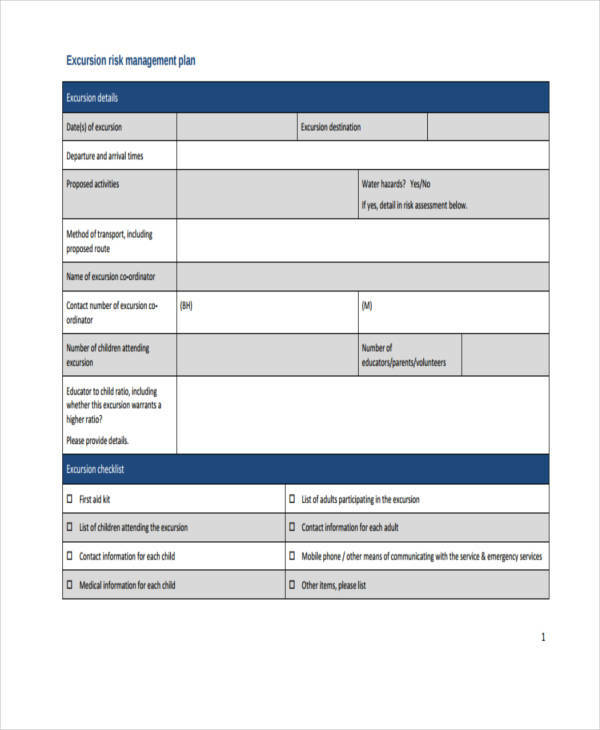 In the event that a land will be for rent, this assessment form can be presented to inform the involved parties in a rent agreement about the hazards and dangers. 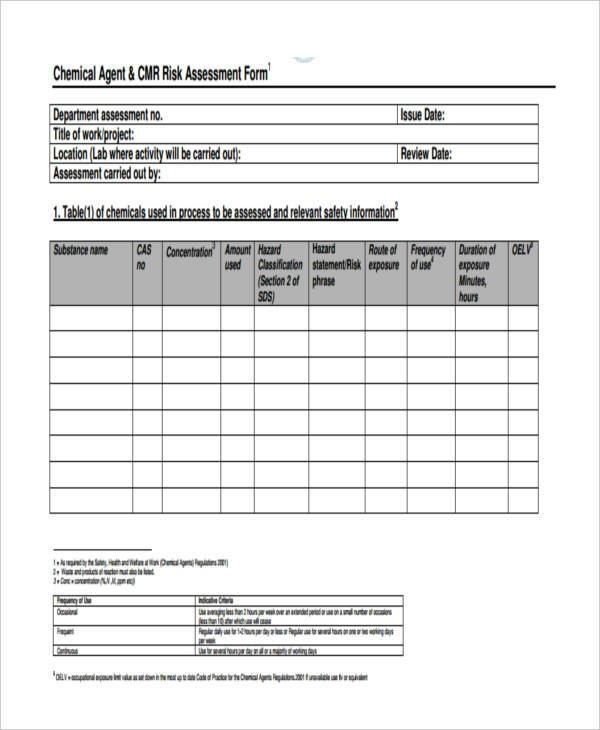 Chemical Risk Assessment Form – In chemistry laboratories and stock rooms for chemicals, the handler and the chemists should take a high level of precaution when dealing and be using the chemicals. 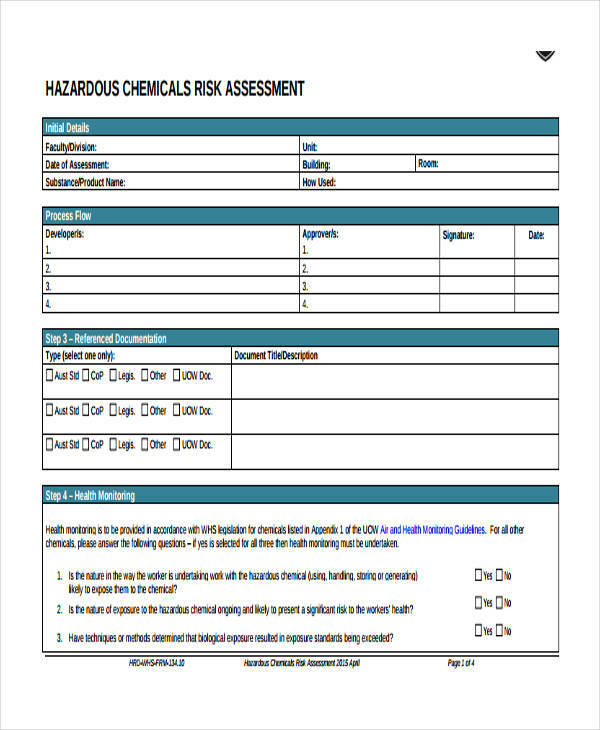 A chemical risk assessment form will state the type of substance present in the containers or in the room. It will also describe the chemical properties which are evidently found in the substance which is harmful to anyone who will be exposed whether through inhalation, absorption or through ingestion. 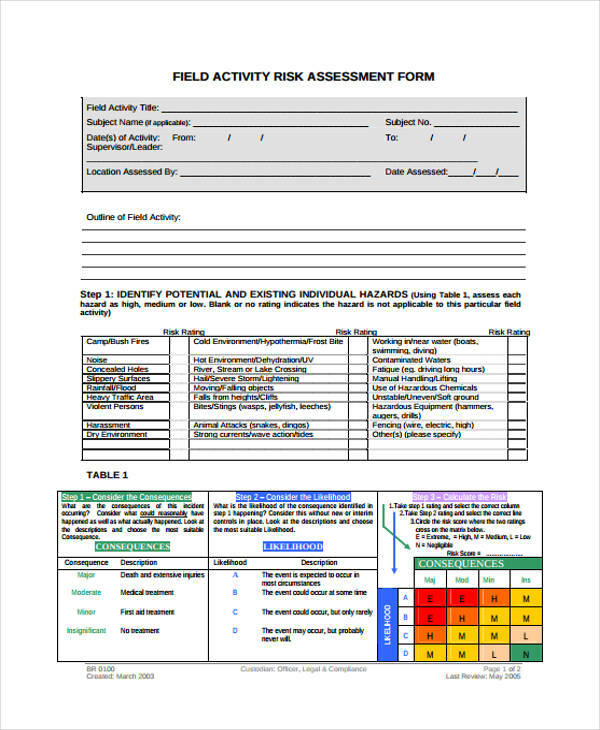 Field Risk Assessment Form – This risk assessment form can also be used together with the task risk assessment and the event risk assessment as this deals with activities and outdoor matters. Before a field trip proposal will be approved, the management and the administration should assure that the field or area where they are going is safe for the involved parties. 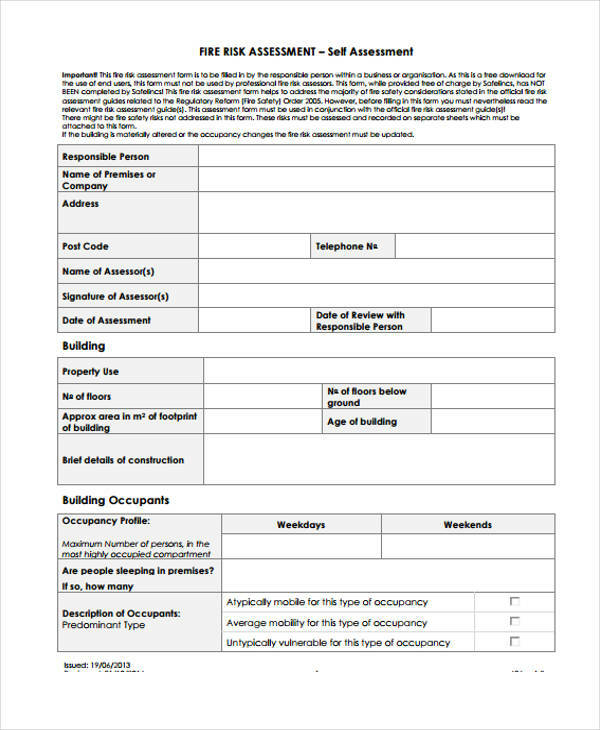 This assessment form can also be used by workers to state their observations in a construction site where they are working. They must state the type of work they will be doing in the field, the identified physical and chemical dangers, and the possible methods of control to avoid the risks. 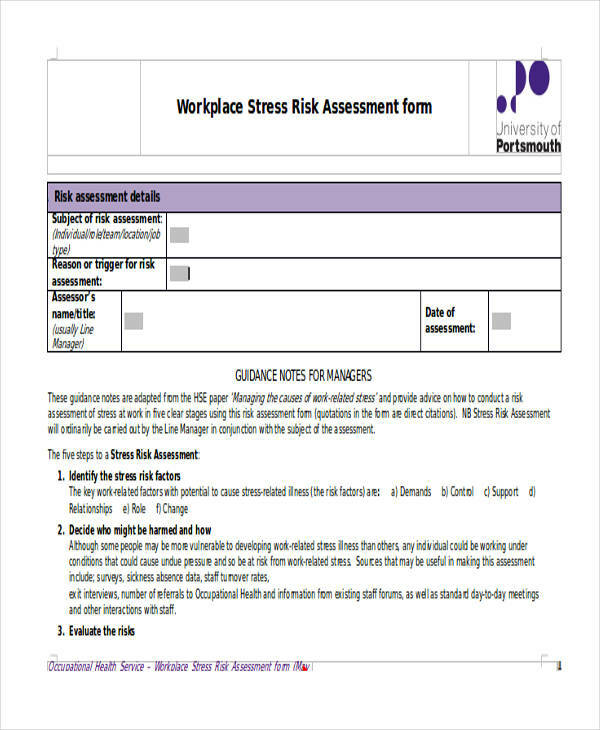 Stress Risk Assessment Form – This form connects together with the workplace risk assessment form however this centers on the emotional stability and dangers of the employees. In various states and countries, employers need to conduct this assessment as part of the legal requirements in operating a healthy and employee-friendly business enterprise. 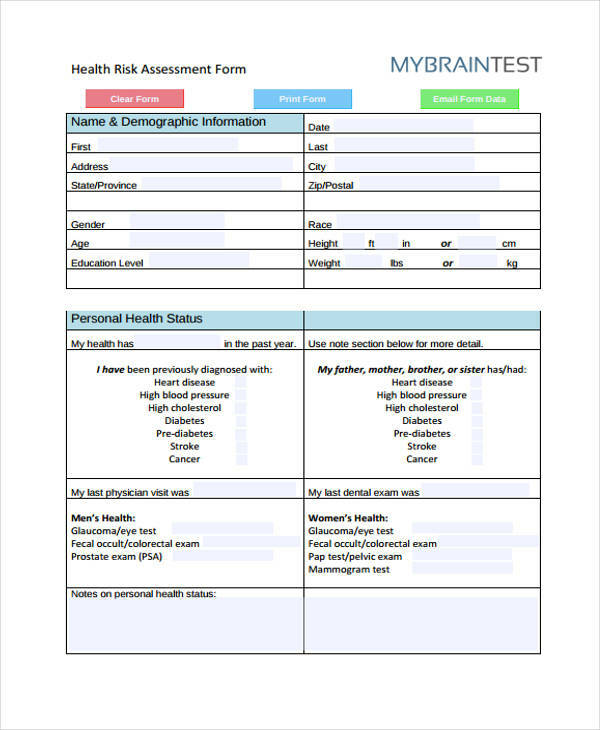 One common benefit of using a stress risk assessment form is identifying the early signs of a stressful and depressing work environment. The percentage rate that a company will acquire a successful employee-management relationship will be the result of efficient stress risk assessment scanning and evaluation. 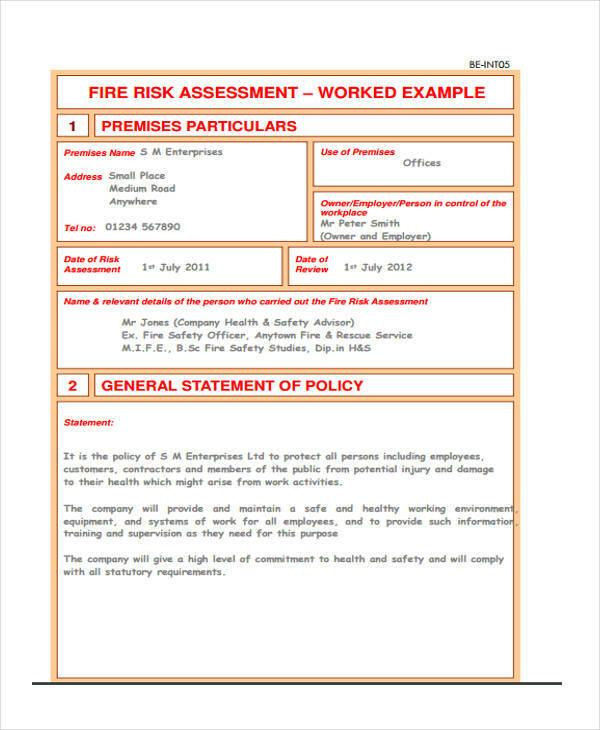 Fire Risk Assessment Form – Faulty electrical equipment and cluttered materials in premises are two of the known reasons why a fire incident is reported. A fire can be avoided if the owner or the people in a location will observe good housekeeping as well as doing an in-depth fire risk assessment. 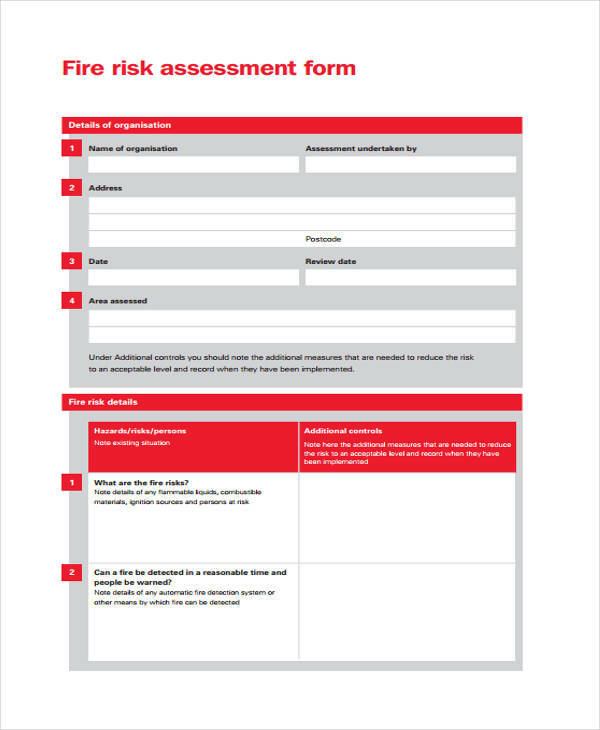 A fire risk assessment form will have the details of the property which will include a list of the possible reasons why a fire may occur such as the lack of an updated fire hydrant, octopus wiring, and heated appliances. With regards to a forest fire, a forest engineer or any organization can conduct this assessment in order to assure that there will be no man-made incidents to cause the fire and to make sure that the trees are healthy enough to sustain themselves in the heat of the sun. 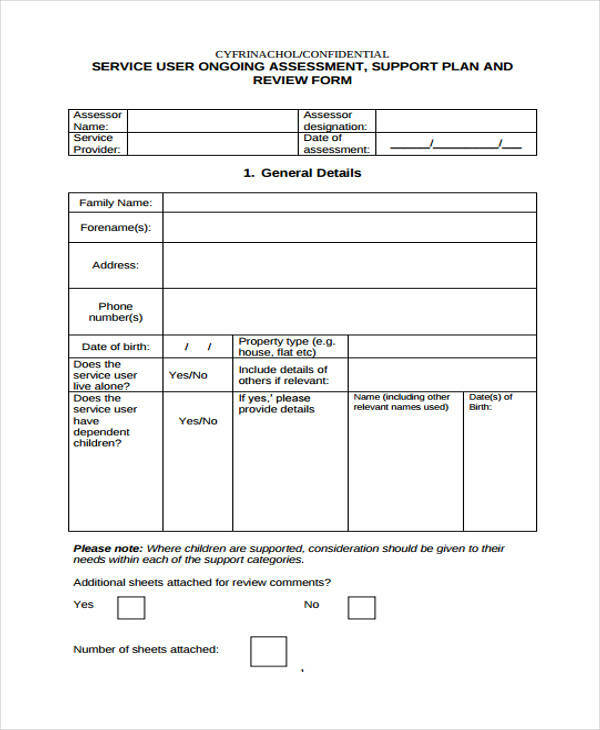 Service Risk Assessment Form – Providing a service to anyone is a good thing even if there are risks and dangers associated with the service that an individual grants. However, a free service from volunteers may promote happiness, dangers and hazards should also be the part of the things to put into consideration before heading out to serve others. 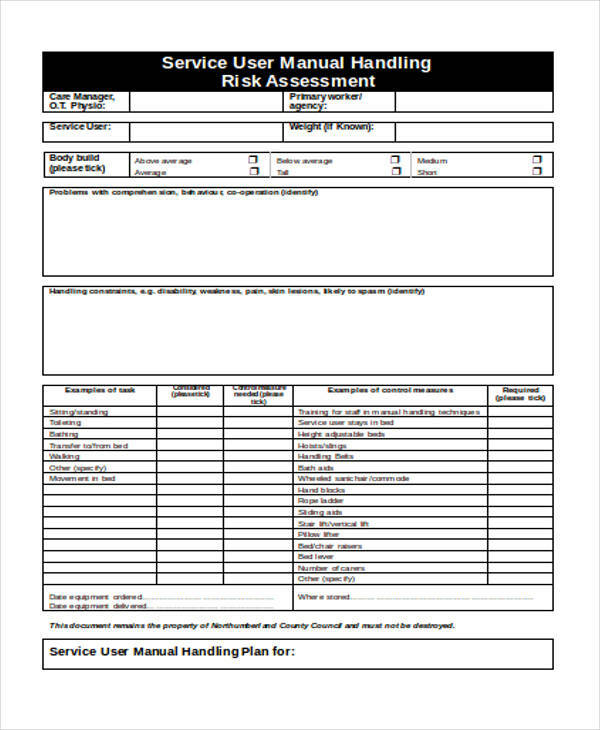 A service risk assessment form will indicate what incidents may hinder the success of providing a particular service and how the service providers can avoid them. This can also be used by medical personnel to distinguish the illness which is contagious and may harm them as they cure and write a doctor’s note for the patient. 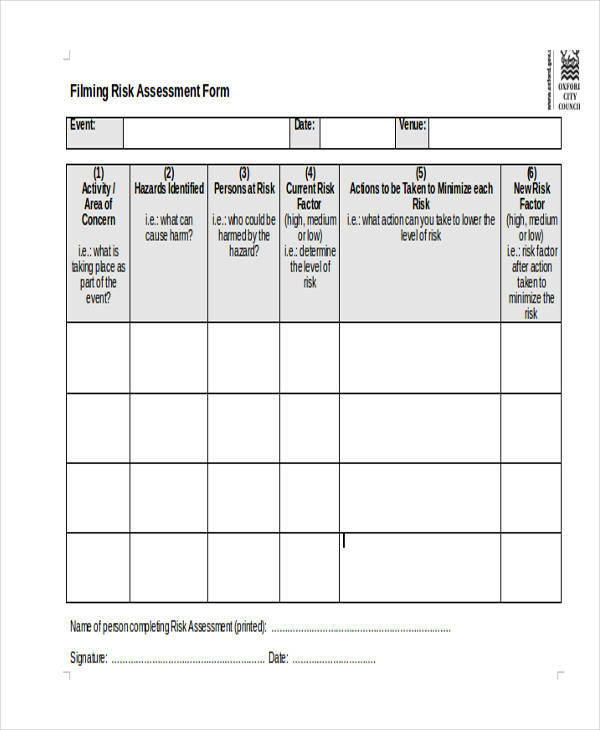 Film Risk Assessment Form – Filming a movie or any sort of viewer’s entertainment can often lead to an accident especially for those who are into the genre of action movies. 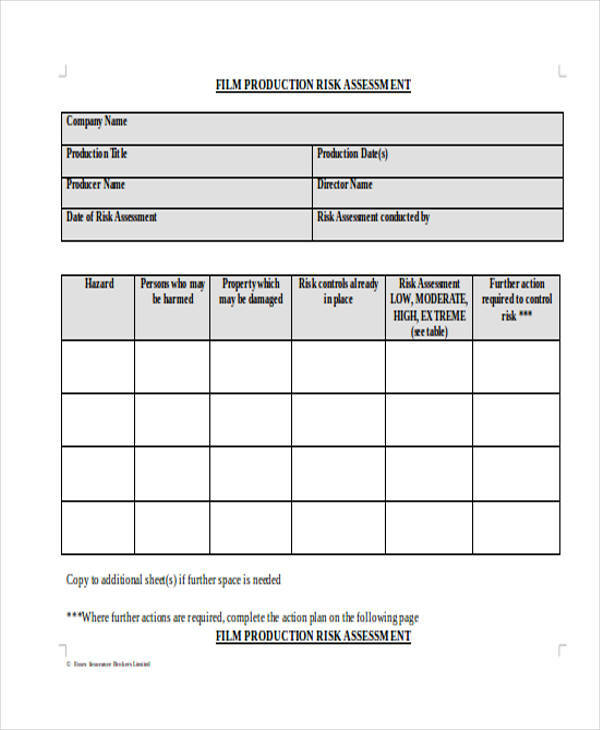 The producer, as well as the production crew, w should determine the risk of stunt and state these in a film risk assessment form before the stunt will be performed. This will assure that no actors and members of the crew will be harmed during the movie filming. 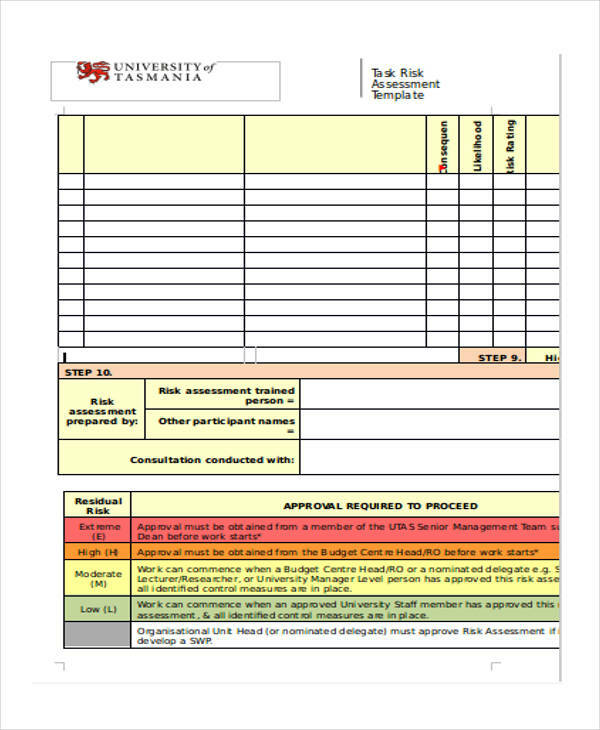 Excursion Risk Assessment Form – The term “excursion” is another word that refers to a journey or a trip. 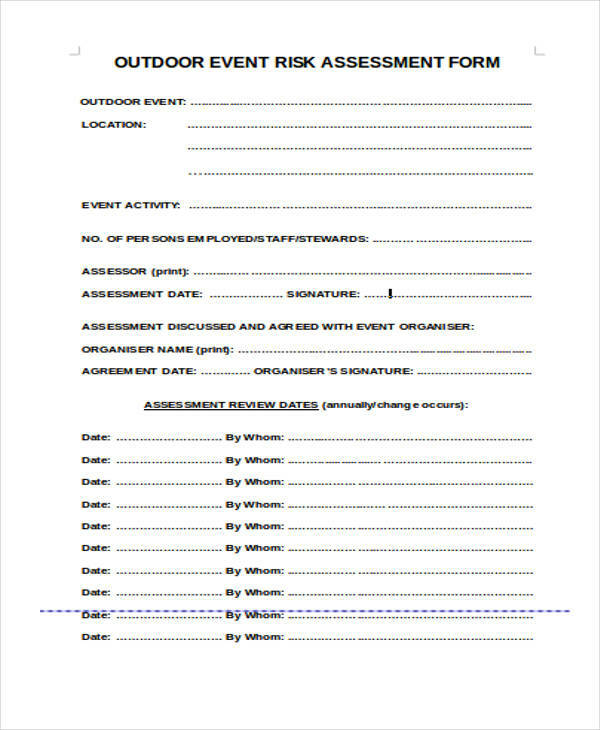 The users of an excursion risk assessment form are often the councilors or officers of a city wherein they must assure that the site where the activity will be held is secured and safe for the participants. This process of assessing the matters involved in the excursion will also aid in minimizing and decreasing the chances of dealing with school complaints from the students’ parents if an activity is not done well. 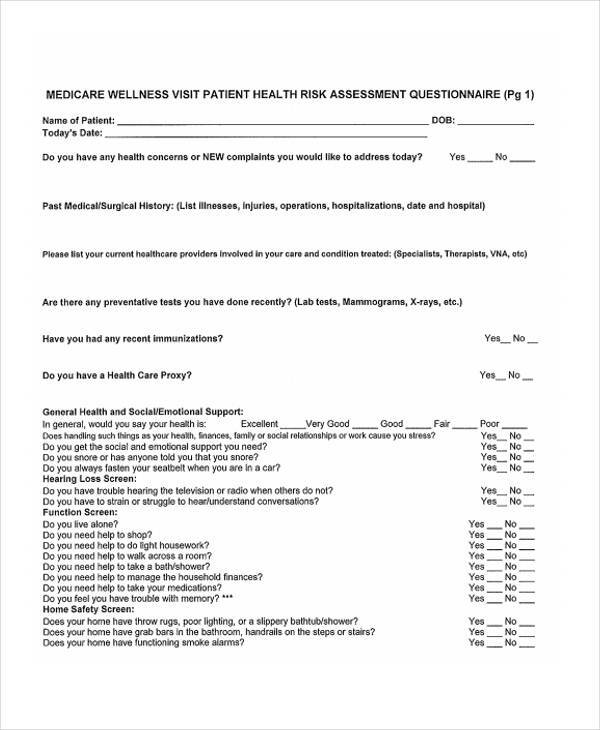 The types of risk assessment forms are not limited to the seventeen aforementioned varieties as the need to assess and evaluate a risk is a clear responsibility of any person at any age and level.